Silbannacus - Augustus (usurper) of Imperium Romanum from 253 AD? to 253 AD? Silbannacus is a mysterious figure believed to have been a usurper in the Roman Empire during the time of Philip I (244-249), or between the fall of Aemilianus and the rise to power of Valerian (253). 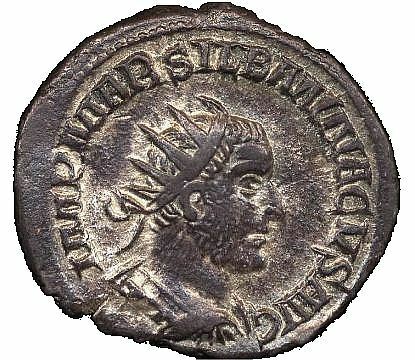 Silbannacus is known only from a two coins, an antoninianus reputedly found in Lorraine and a second coin, which - according to the style - was struck in Rome, and since the shortened legend is present on Aemilianus coins in 253, Silbannacus may have been an officer left to garrison Rome while Aemilianus left to face his rival Valerian. After the death of Aemilian, he would have tried to become emperor before being quickly eliminated by Valerian and his son Gallienus.